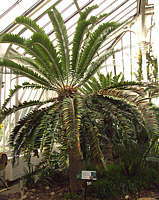 The Cycadales is an order within the Gymnosperms that contains three Families of Cycads: Cycadaceae, Stangeriaceae and Zamiaceae. Cycads have a crown of large, compound, fern-like leaves on top of a slow-growing woody caudex or stem which may be mostly underground or reach a height of 50ft. Most of the structural support is provided by persistent woody leaf bases around the stem. The waxy leaves emerge from the apical bud with leaflets tightly coiled inwards. 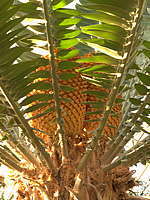 Cycads produce male and female cones on separate plants. Cycads are often considered to be living fossils, appearing in the Upper Palaeozoic 290-265 million years ago. The genus Cycas probably diverged from the Zamiaceae between 250 and 92 million years ago. Cycads are most closely related to a group of extinct seed ferns. Herbivorous dinosaurs browsed on Cycads, which evolved toxins to discourage predation. They survive as a distinctive group of tropical and sub-tropical palm-like trees and shrubs. Cycads have coralloid roots that form symbiotic associations with nitrogen-fixing cyanobacteria, so enrich the poor soils in which they often grow. However, they are unpopular with farmers as they are highly toxic to livestock. Despite their toxicity, Cycad nuts and their starchy pith are traditionally prepared for food by prolonged washing or other treatment. 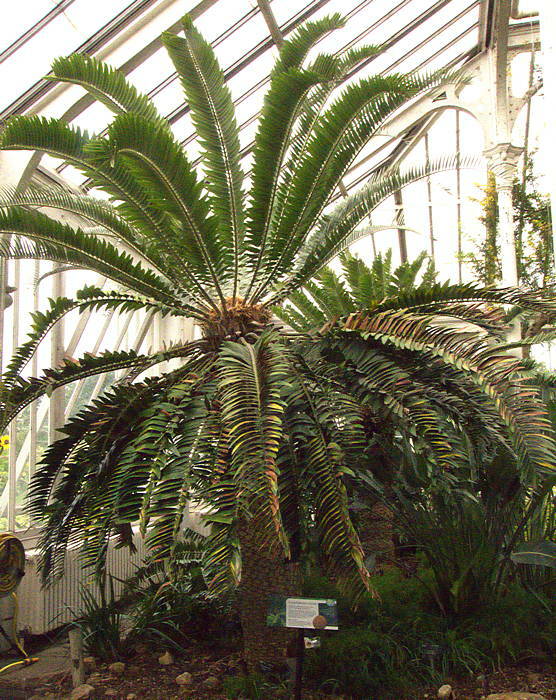 A large collection of Cycads may be seen in the Palm House and Temperate House in the Royal Botanic Gardens, Kew.